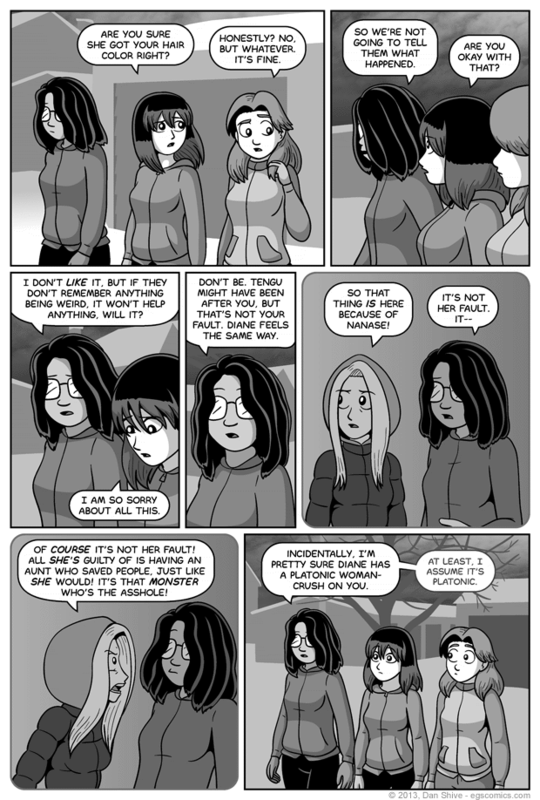 For the record, Ellen's hair is nearly 20% lighter than normal in this comic. WAY TO GO, CRANIUM. Dare I remind everyone once more that there were Sketchbook entries on Saturday and Sunday and weekend sketchbooks are now a regular thing? I DARE. I also dare to point out the RSS feed. If you're wondering when Charlotte had a chance to bring Diane up to speed, recall that they were together after the flight--er, fight concluded. Charlotte presumably ran into Diane after she left. In any case, this means that, yes, Diane knows everything Charlotte knows about Not-Tengu's motivations. And with that commentary stated, I'm going to go prepare to celebrate the Labor Day holiday the way it was always intended to be: By having a whole bunch of movies and TV shows on while making more comics. It's tradition!